Comic book layouts are pretty popular. And they work well for elearning courses. For one, they look different. It’s that type of contrast that can hook your learners who might be bored with the standard-looking corporate elearning. On top of that a comic-like layout breaks the content into panels which allows you to control the pacing and flow of information as each panel progressively reveals more. It’s a great way to still have the simplicity of a linear course, but make it seem more engaging. A while back I shared how to be inspired by others and included links to two comic-style elearning courses. Based on the feedback, the examples were a hit. I got quite a few emails asking how to build a similar type of course. 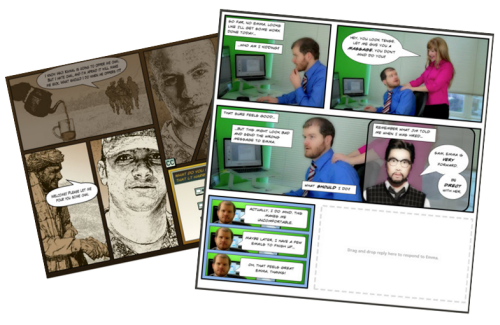 In today’s post I’m going to show three ways to build a comic-style layout for your courses. To keep it simple we’ll use PowerPoint, but the ideas should work regardless of the tool you use. Layouts are the key distinguishing feature for the comic book look. Typically they follow some sort of grid. The good thing is that there’s really no right or wrong way to create the grid. Some comics use straight lines and even sized panels. And some use an assortment of panel sizes. You can also create your own layouts with existing clip art. Here’s an example I shared in this blog post on using Clip Art to create your elearning template. This also lets you build a layout that has that hand-drawn look. For this demo, we’ll use a few simple layouts. I created them as shapes in PowerPoint. As you can see below, creating the layout’s pretty simple. Feel free to create as many layouts as you want. Keep in mind that too many choices can be overwhelming. Instead of building 200 possible layouts, stick with 5-10 common layouts. Another consideration with layouts is determining how you’ll present the content. Review the two elearning examples above and notice how the layouts follow a consistent pattern. For example, you may have one type of layout for information, another for decision-making, and another for feedback. 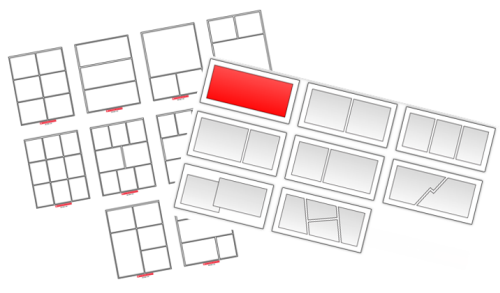 Deciding how to use the layouts will help you best determine which types of layouts you need. 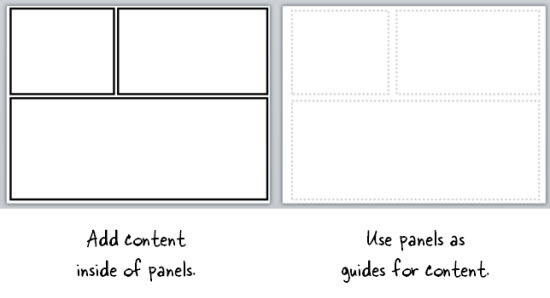 One last point, the more panels you add to the layouts, the less space you get. If you have too many panels the content make look cluttered and seem confusing. I’d err on the side of fewer panels. Use PowerPoint’s master slides to create the layouts. You can have as many masters as you like so the best bet is to create all of the possible layouts that you’d use in a single file. And then when you’re ready to go, select a layout for the slide and add your content. Create the entire panel look on the slide master. Then apply it to a slide and add content within the panel. Create watermarked panels on the master slide and use them as guides to control placement of your content. The benefit to this is that you have the general layout mapped, but you’re not confined by the panels if your content doesn’t fit perfectly. Use thick lines and determine how colorful you want the panels to be. Think loud and in your face. Not all of your content will fit perfectly in the panels. That’s OK. Build your content on the panel and get it to fit the best you can. Then copy and paste it as an image. Use the crop feature to perfectly crop it to the panel. Tutorial: this tutorial walks through the template and shows a few production tips. Instead of building the layouts on the master template, build them on the slides. This gives you more control over the panels because you have direct access to them since they’re not buried in the masters. Build a master PowerPoint file that has all of the layouts you’d use. Then start with that file when you want to build a comic-inspired course. Make sure to save it with a different name. Duplicate the layouts you want and then add your content. Instead of creating your panel shapes on the master slide, create them on the slide. This lets you manipulate the shape at the slide level. Add content on top of the panel shape. Create panel shapes with thick lines and no fill color. Then place them on top of the content. The thick lines will cover up anything that doesn’t fit perfectly. Fill the panel shapes with an image. I like this approach because the panels and content will always align perfectly. The only thing that changes is the fill image for the shape. PowerPoint lets you create slides of any size. Create template files where the slides have the same aspect ratio as the various panels. This way you always know that the inserted fill image fits perfectly inside the PowerPoint shape. You can download some examples in the file below. 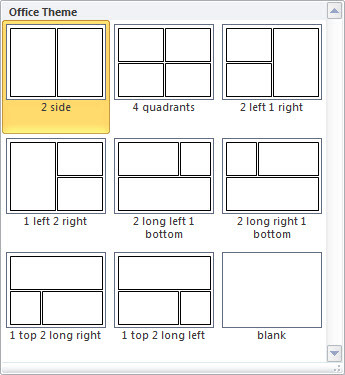 Tutorial: How to work with comic-panel#.ppt and create images to fill the comic panel shapes. This is probably the easiest way to create a comic layout. Instead of messing with a bunch of images and trying to get everything laid out perfectly, just create a series of layout images that you place on top of your content. Essentially, you have one image of the entire page. Then you cut a hole out of the page for each panel. All of the content sits underneath the page image and can only peak through the holes. This guarantees that everything is perfectly aligned inside the panel. I like this approach because you can move each object in the panel and the overlaid master image masks any overflow to create the illusion of panels. Add your page images to the master slides so that you have a layout. This will act as a general guide. Your slide for each layout you provide should consist of a master slide with the same page layout and the page layout image on the actual slide that acts as the cover. 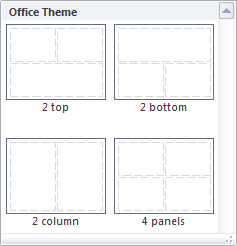 Be sure to use the selection pane in PowerPoint (starting with PowerPoint 2007). Hide the page image and add your content using the master as a guide. Then unhide the page layout on the slide when you’re ready to publish. Make sure the cover image is always on top in the selection pane. Tutorial: How to create layout mask images to use as panel covers. To help you out, I created a starter PowerPoint template pack. You can download it in the elearning community. It includes folders for each type of template. You can use them as they are or build your own. 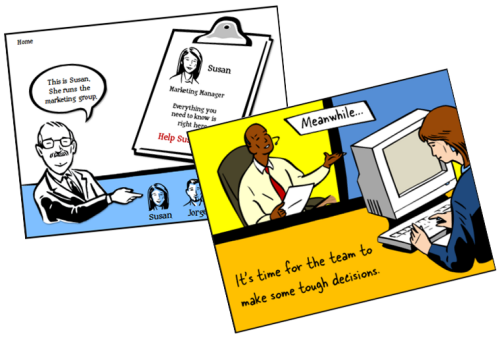 Comic strip layouts are popular and a nice way to make your courses look a bit different. The trick is to determine the type of layout you want and how to get the content into the panels with the least amount of work. There are many ways to layout the comic panels. 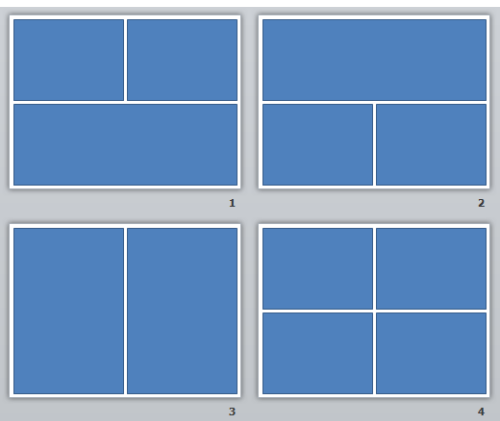 Once you decide the type of layout you want, then you need to determine how you will get the content into the panels. 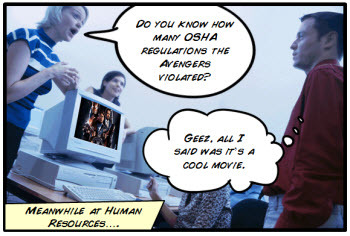 The first time I saw this: Broken Co-Worker (Articulate Storyline) I was astonished and wanted that, but thought it was difficult and implied a lot of work and effort. Today, thanks to this post, which I’ve followed practising with it (I mean, I opened Power Point 2010 and started doing things while I listened to Tom), I think I could do it. Thanks for what you bring to our minds! Great post. Another great resource is Comic Life software. It’s fairly cheap and has lots of possible layouts and makes working with photos and dialogue balloons really easy. Also, Pixton looks interesting because of the ability to create characters and pose them in different ways although it looks like it could be costly for an entire course. Great post, Tom. Thank you for all of the tips, resources and tutorials! how do I find the style number to find more of this person? Some of the clip art is assigned to a style and you can locate it in the properties of the clip art. Unfortunately that particular image doesn’t have a style listed, so you’d have to find them the way you did bu clicking on the similar images button. Love these tips! I am working on a comic-themed business writing course in Storyline and this post came just at the right time. Hi there – thanks Tom, I love the ideas of using comic strips, and I’m hoping I can use this inspiration for communication too. Can anyone recommend some examples of how this medium has been used by others to communicate safety messages? I have a project where I have to design a poster for communicating incident feedback to manual workers on site. They don’t have access to computers, so I have to get the message across visually – with as few words as possible – the old adage ‘a picture is worth a thousand words’. I basically have three main topics. 1) What happened 2) Why it happened, and 3) What systems have changed? Sorry if this isn’t completely Articulate related, however, I’m developing the poster in powerpoint (even though it is A1 size) and it will be presented at a weekly safety meeting as a presentation. So having something which can be presented interactively by a facilitator, and then printed out in it’s entirety is my ultimate goal. Phew!! The post has a couple of links to some good sites that may inspire some ideas and possible layouts. Another great blog entry. I saw The Broken Co Worker a couple of weeks ago in the demos attached to storyline. It’s a great example of what can be achieved with a little creative thinking of how to use the tools that exist within Storyline. I think an important part of pulling off the comic ‘look’ is the choice of font. I’m not a fan of Comic Sans, like many I suppose 🙂 I do like Tom’s choice of font at the top of this post and am wondering if this is from the free fonts distributed on this blog in an earlier post?? Any suggestions on suitable font strategies, Tom? @Rob: there are a number of free comic type fonts. I like this site, but like many free sites, there are some limitations on commercial use. If you use the font a lot, it’s worth buying. @Scott: the screenrs in the comments show how to build it. I believe Adobe Premiere elements has that colorful cartoon look as a filter. You can probably connect with Ryan or Anna in the Articulate community if you have specific questions. Very interesting post. I’ve seen a lot of creative approaches to engaging learners in what would otherwise be boring or tedious, but very important materials, such as safety training or security. I’ll have to try this with the characters and effects I use from eLearningstock especially the customizable animated ones! I would like to know which software you willrecommand to create an elearning comic book ?